Once again, Android has thoroughly stomped the competition, according to a survey of US smartphone users by Nielsen. 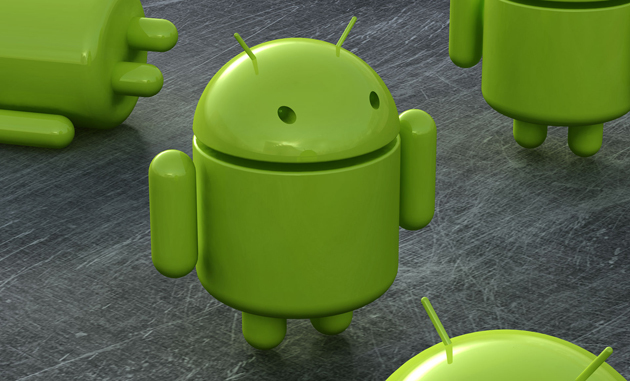 As of August, 43 percent of all smartphone owners in the US use a device that runs Google’s mobile operating system. 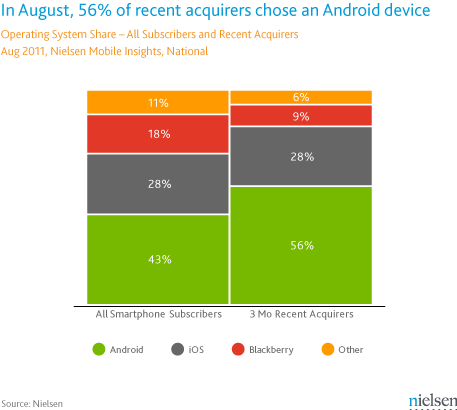 And of those who purchased a smartphone in the past three months, a full 56 percent chose and Android device over everything else. Apple’s iPhone line remains solidly in second place, with 28 percent of the US smartphone market. The same number purchased an iPhone in the past three months. But Nielsen expects the number of new smartphone buyers to jump toward Apple in the coming months, as the company is expected to unveil its newest handset, the iPhone 5. BlackBerry remains the third most popular line of device, with 18 percent market share. But only 9 percent of new smartphone buyers went with BlackBerry. Devices running all other operating systems only account for 11 percent of the US market, and a mere 6 percent purchased something other than a BlackBerry, iPhone or Android handset in the past three months. As predictable as Android’s current upward swing may be, it’s still impressive. What would be far more impressive, however, is if the iPhone were still ahead of Android. Right now, there are only four models of iPhone available, and only two of them (3G S and 4) are regularly available from carriers. Compare that to the countless number of Android devices, available at all price points, and it’s obvious that this isn’t a fair fight. It’s because of this unbalance that the rumors of a second, less-expensive iPhone release this year ring true – and are looking ever more likely by the day. Apple has the top-end market under control. But its handsets remain too expensive for many. If Apple does release a cheap iPhone model this year – especially if the device is unlocked – then we could see significant upward movement from Apple’s corner.